The stocks listed today are some of the top candidates on my buy list for trend opportunities over the next several months. Each of these stocks has been screened numerous times on the MSW Index in 2007 and will be featured on the NEW MarketStockWatch.com that will be released in late April. I am changing the MSW format to a service that generates revenues strictly from advertising rather than subscriptions. I am excited to release my research such as daily screens, weekly screens, the MSW Index and the MSW Portfolio to everyone for free. I will have the new site up and running when I return from my trip to Hawaii in April. I am looking forward to the trip to clear my head from the recent events in my life and to start a new venture for my equity research company. I would like to thank the 700+ members that signed up for at least a trial subscription to MSW over the past two years; it was a great ride and I enjoyed every minute of it! Don’t worry, the new version of MSW will be even better as I will move to a blog format so I can incorporate images easier and post on a more frequent basis with total control of the site. EDU – 43.69, the stock has been acting excellent over the past several weeks during the market drop as it actually offered a key entry above $34 to start the month. 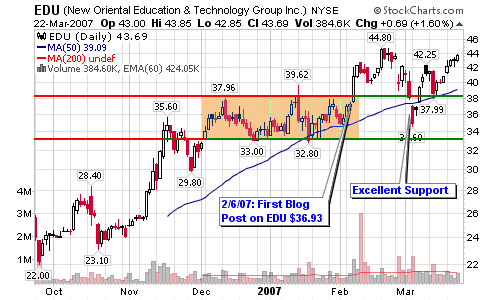 The MSW Index stop loss area was $30 so EDU is very much a candidate. The ideal entry is near the 50-d m.a. CBEY – 29.03, the stock has been consolidating over the past four months without violating the 200-d m.a. so that is positive but recent volume has been increasing on distribution days. It is a buy if it holds support above the 200-d m.a. FTI – 69.26, the stock came to the MSW Index as a possible $60-$100 candidate and has held up very well in March with an 8% gain and a 17% gain in 2007. Ideal trend buys above the moving averages or the $64 support area. ICON – 21.22, the stock hasn’t moved much over the past couple of months but the consolidation is welcomed after the large two year run from $4 to $23 (475% gain). My ideal area to grab shares is along the 200-d m.a. and I will wait for this potential opportunity (I will not chase). NMX – 136.31, I purchased the stock in January at $119 but I sold after the large declines in exchange stocks for a small profit earlier this month. That’s too bad because it is now back above $136 and showing solid action on the weekly chart. I am looking to reestablishes shares with $130 as the current pullback target. KNOT – 23.54, a very interesting stock that is currently catching support along the 200-d m.a. for the third time in two years. The huge distribution from February concerns me so I will need to see some up-ticks accompanied by strong volume before I enter. ZUMZ – 41.83, the stock is now acting well after being placed onto the MSW Index at $35.81 with an original buy at $32 and a target of $40 (this was accomplished). The stock started to make my screens just when WallStrip was making a video on the company. Weekly accumulation versus distribution looks solid. 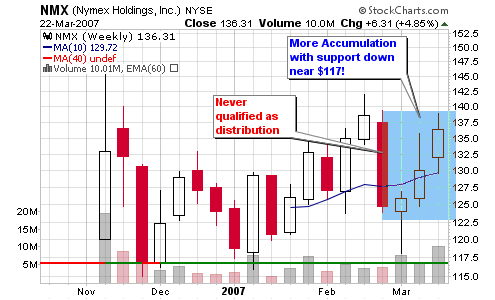 We now need a new setup to form in order to grab shares or add to an existing position. LVS – 91.25, the stock was a superstar in my own personal portfolio last year and has since been sold but I am now interested in a new position as it looks to be holding support above the long term 200-d moving average. I would like to see stronger volume during up-weeks before taking this venture once again. HWCC – 25.34, a new candidate to the MSW Index in March as the stock shows excellent “young growth stock” characteristics and a chart pattern that is trending higher with an ideal entry above the 50-d m.a. or near support at $23. To see all of these charts and much more (90 charts in all), visit my personal chart’s page over at StockCharts.com. I do need to update my annotations but give me some time because I am just getting back into the research this week. HI chris. I just checked the EDU chart in stockcharts. I notice divergence between price and MACD and also RSI. I know that this sounds too technical, but do you consider this at all in your evaluation of a stock? I do look to these occasionally but not they don’t force me to decisions in the market. However, I wouldn’t buy shares at this level as the stock is extended from the ideal entry area. i would look for a consolidation near support and then jump on additional shares. I’m a former site member and regular reader. I’m glad your going to try the blog/ad model. I think you have quite a bit of good stuff to say and I think you will get a much wider audience. I’m looking forward to it. Thank you – that’s one of my best comments ever! I’ll keep you posted on the new MSW and how it goes (it will take time to gather accurate results). I went to MSW and the subscription service is still existent. I am interested in your service, and am wondering whether you will be switching to blog/ad format.